We are witnessing a rapid growth in the demand of cabs from last one year. We now have many cab operators in major cities of India that each of them are trying to overcome other in terms of service they provide. Some major operators like Ola and Uber are upgrading their technology constantly to enhance their service quality. 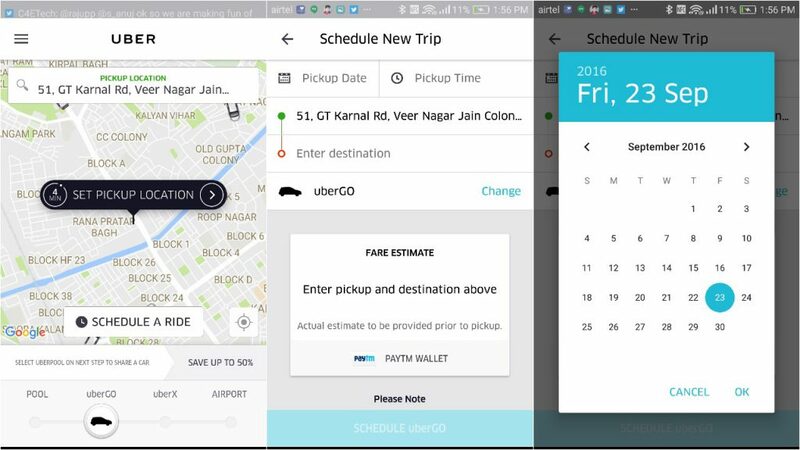 One of the recent upgrade that Uber has done is the schedule ride. A lot of times we try to book a cab during peak hours and find no cabs available at that moment. Or we may have tried to book a cab when there is surge pricing. Sometimes we fail to book a cab because of the internet connectivity issues. Also at the time of urgency, the cab drivers arrive late to pick you up, resulting in reaching our destination late and it further has its own complications. Uber has brought the solution to all of these issues faced by regular commuters. As the name suggests, schedule ride means we can pre-book a cab from time ranging from 15 minutes to 30 days. This feature was first introduced by Uber in Seattle in June this year. 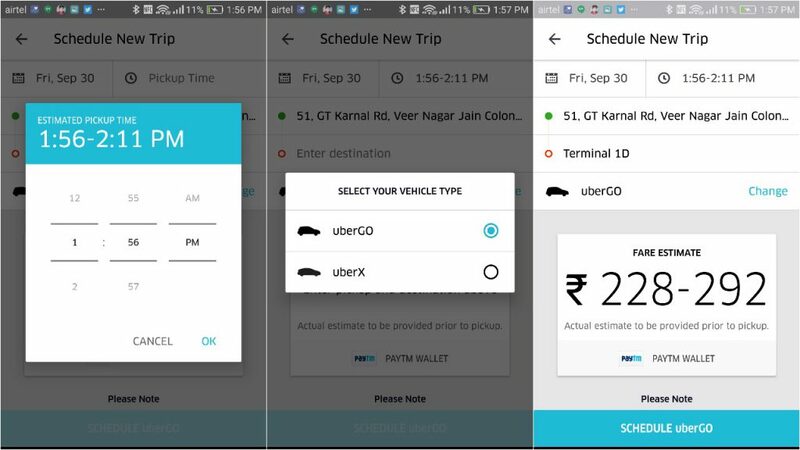 Now, Uber have extended this service to India. The updates will be coming in batches for both Android and iOS. It is noticeable that Ola had launched this feature long back but it stopped this recently. The schedule ride feature also sends the reminder to the riders once at 24 hours before the booked time. Another reminder 30 minutes before the scheduled ride. Riders also get the option to cancel the ride if required. According to us, it is a really useful initiative by the company. Scheduling a Uber ride is too easy. Just above the normal booking option, you get the Schedule A Ride Option, click it. Choose the type of cab that is UberGo, UberX etc. Then click on schedule the cab. This would be saved in upcoming trips just like the normal trips. You can cancel the cab by edit option in the upcoming trip and cancel easily. Hope you guys use this newly added feature. As Uber says “it’s one less thing to worry about”.